IBM researchers today unveiled the fastest and most highly integrated optical data bus ever developed. The prototype technology could bring massive amounts of bandwidth in an energy-efficient way to all kinds of machines—from cell phones to supercomputers. This could revolutionize the way we access, use and share information across many different applications. The new technology uses light instead of wires to transmit information. This could allow, for example, the transmission of 8 terabits of data per second—equivalent to about 5,000 high-definition video streams—using the power of a single 100-Watt lightbulb. Bandwidth of this magnitude could greatly enhance the energy efficiencies of entire data centers and accelerate the sharing of large datasets. The potential advantages are far-reaching. Whether it's scientists crunching data to discover new drugs or to forecast the weather, people sharing high-definition movies on various devices, doctors sending high-definition medical images to a specialist for diagnosis within seconds while the patient is still in the office, or bringing the power of high-definition to mobile phones, the enormous bandwidth capacity of this new technology could change the way we work and live. In the context of so-called green computing initiatives, the new optical technology could save massive amounts of power in supercomputers. For a typical 100-meter-long link, the power consumed by this new optical technology is 100 times less than today’s electrical interconnects. This translates into a power savings of 10 times over current commercial optical modules. The new prototype, called a "green optical link", is designed to meet the bandwidth requirements of petaflop and even exaflop supercomputing. As such, it constitutes a significant leap from related work announced by the same research team just one year ago. The new technology combines optical chips and optical data buses into a single package together with standard components. "Last year we introduced an optical transceiver chip set that had the capability to transmit a high-defintion movie in less than one second using highly customized parts and processes. Just a year later, we've now connected these high-speed chips through printed circuit boards with dense integrated optical “wiring”. Now we have built an even faster transceiver not with custom pieces, but using all standard, commercially available parts and tools," explains IBM researcher Clint Schow. "These aren't theoretical experiments or chips sitting in unique conditions in a lab, but rather chipsets that could hit the market in the next two years. The innovation lies in the fact that we are making optics with the same kind of packaging as electronics." 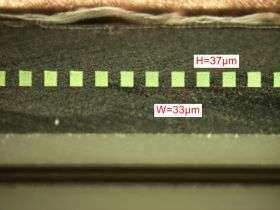 The optically-enabled circuit boards, called "optocards", employ an array of low-loss polymer optical waveguides to conduct light between transmitters and receivers. This technology was developed by scientists at IBM's Zurich Research Lab. The complete databus constructed with such optocards not only incorporates a large number of high-speed channels, but also packs them to an unprecedented density: each waveguide channel is smaller in diameter than a human hair. The packaging approach for the complete system is unique in that it utilizes hybrid chip integration to produce a highly integrated optical module, called an "optochip". The applications for this technology range from cell phones to supercomputers and span industries from consumer electronics to healthcare. High-definition video: As high-definition video becomes increasingly widespread, the new optochip technology will facilitate video sharing and video on-demand by dramatically increasing the bandwidth of video servers. Web-serving sites that host videos could use the technology to access libraries containing millions of high-definition movies and video clips within a few seconds, thereby accelerating access greatly. Patient care: Physicians and researchers will be able to send high-definition images such as MRIs and heart scans—which are huge files—for real-time analysis and 3-D visualization. Consumer electronics: Scaled-down versions of the optical interconnect technology may find applications in a range of consumer products. For example, in cell phones, one chip could reside in the base of the phone and another in the display. This would allow very large files, even high-definition content, to move from onechip to the other. The advantage of this is that, by using optics instead of wires, the display can be turned up and down or from side to side without being impeded by electrical wires. By incorporating an optical data port in laptops, high-definition video recorders, personal mp3 and video players, cell phones, and PDAs, high-definition video content can be stored and displayed on high-resolution external screens. The improved bandwidth of data interconnects will enable massively parallel supercomputers to have a profound impact in many fields. Potential applications range from improved molecular dynamics calculations, accelerated drug development processes, more accurate weather/climate modeling, as well as advancing our understanding of subnuclear physics such as in the field of quantum chromodynamics. The prototype revealed by IBM scientists today is the world’s fastest and most highly integrated optical data bus to day. By connecting a staggering number of high-performance computers, it has the potential to achieve unprecedented performance levels. The optochip is a multicomponent 3-D assembly constructed by means of conventional surface-mount solder processes similar to those currently used in the mass-production of electrical chips. The 10 Gb/channel databus is the first demonstration of an integrated module-to-module, 32-channel optical datalink on a printed circuit board. The need for high-bandwidth photonic communications between chips or modules has been discussed in the technical literature for more than a decade, and various pieces of the pertinent technology have been introduced. IBM has now assembled a fully functional and integrated solution, significantly advancing the field of chip-level optical interconnects. By proving the viability of high-density parallel optics, IBM has accelerated the prospect of real-world deployment of practical, high-capacity interconnects between chips. In addition to the optical data bus, IBM also has developed a parallel optical transceiver module with a higher number of channels and an increased speed of operation: 24 transmitters and 24 receivers that each operate at 12.5 Gb/s. The resulting total bidirectional data transfer rate is an unprecedented 300 Gb/s, nearly twice the performance of earlier generations. Compared to current commercial optical modules, the transceiver provides 10 times greater bandwidth in one-tenth of the volume while consuming comparable power. To enable low-cost volume production, the new transceiver uses standard 850-nm vertical-cavity surface emitting lasers (VCSELs), high-speed versions of the inexpensive devices found in a typical computer mouse. By focusing on innovative packaging of low-cost and low-power technologies such as VCSELs and CMOS chips, IBM Research is paving the way to the widespread adoption of optical communications. Clint Schow "300-Gb/s, 24-Channel Full-Duplex, 850-nm, CMOS-Based Optical Transceivers". Fuad Doany "Chip-to-Chip Board-Level Optical Data Buses". Another piece of the singularity puzzle snaps nicely into place. I bet Ray Kurzweil is thrilled.